This is part 2 of my guide of how to make a home made PCB Board. If you are looking for part one, the link is here. 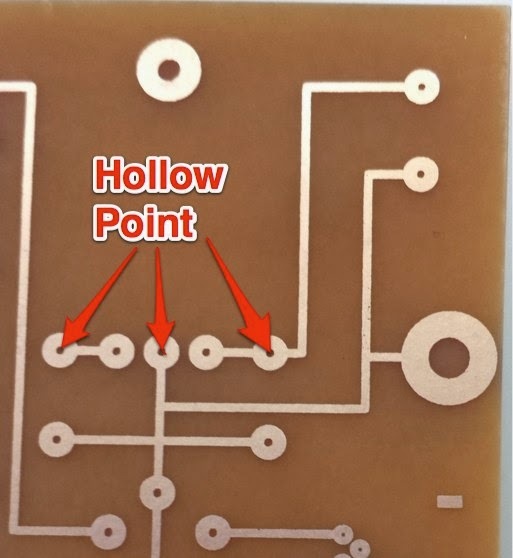 After etching and cleaning off the toner from the PCB board, the next thing that most makers struggle with is how to drill the PCB Board. I personally had to experiment quite a bit as I could not find any good guide on how to drill a PCB board. What I am sharing here is my own personal experience, if there is a better way from the way that I am doing it, feel free to let me know. 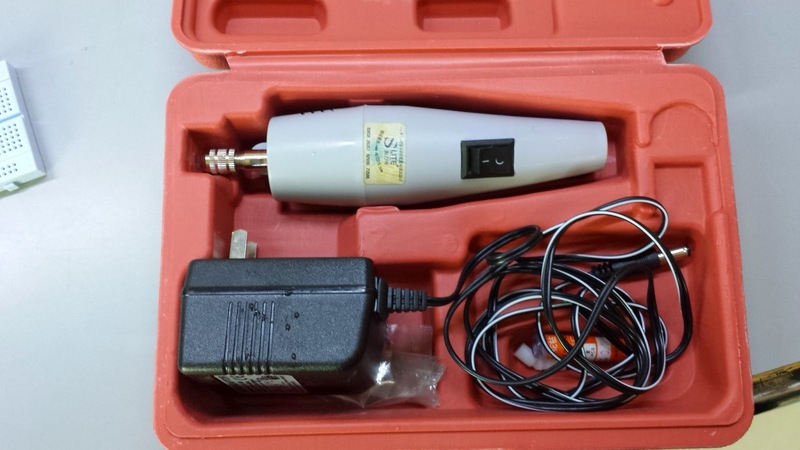 The drill that I am using is a hand held drill that I bought at Sim Lim Tower. Nothing fancy. 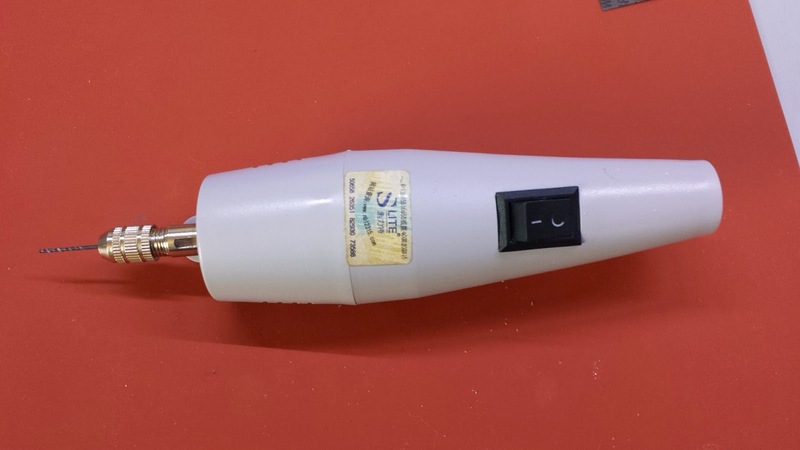 It has several attachments to use the different size bits. Only 1 button to turn on and turn off the drill. I have found that the drill bit that you will most commonly need is the 0.8mm drill. 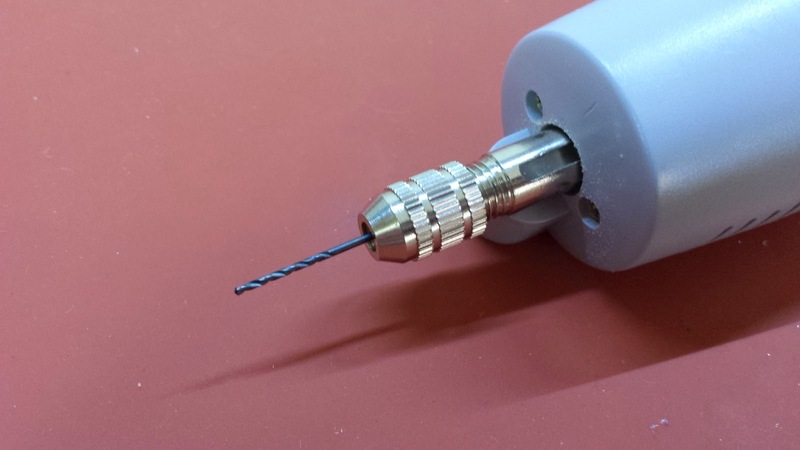 You will also need a 1mm drill bit for slightly bigger pins usually found in connectors. When you etch your board, make sure that you have a hollow point in the area that you want to drill. This will allow you to find the centre point easily and precisely. To make your drilling work easier, use a sharp pointed tool and hammer into the center . This will create an indentation that your drill bit can sit into so that it will not move when you start drilling. Now you are ready to drill. Do not turn on the drill first. Hold the board with one hand perpendicular to the table and the drill in the other. With the drill off, feel for the indentation first. Make sure that you hold the drill in such a way that you can turn it on while pushing it gently against the board. Note that you should not use much strength. Just gently push the drill. The drill bit is very small and can snap into half very easily. Then push forward and turn on the drill. You should be using your thumb to turn on the drill. That's it!! 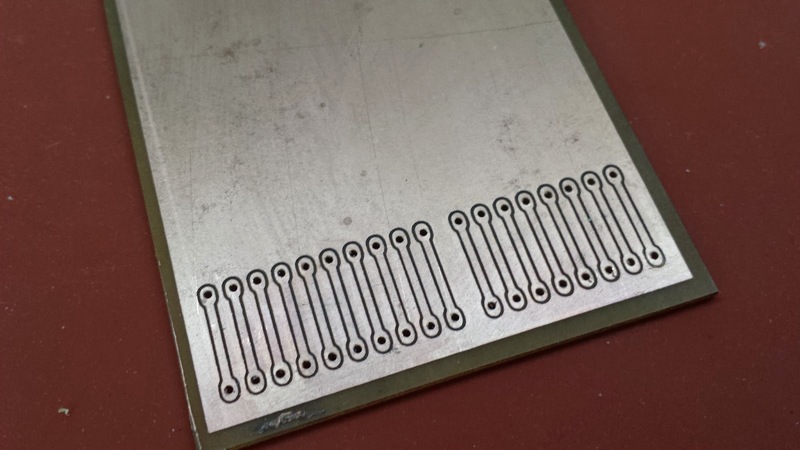 With a bit of practice, you should have no problems drilling your PCB boards. As you can see from the picture below, it is possible to drill very accurately!! Final note : If you are trying to drill a larger hole such as 2mm to 3mm, you may experience that the drill is not strong enough to drill such a large hole. The solution to this, if you do not have a stronger drill, is to drill a small hold first and that gradually increase the size. In other words, start with a 1mm hole, then to 1.5mm then to 2mm and so on. This blog post is long overdue and many people in the makers community have been asking for the instructions on this. So here we go. The first step would be to design your circuit. You can use any PCB design software such as EAGLE or KiCad. I personally usually draw my circuit using Adobe Illustrator. Next, we have to get the trace onto the copper board. The method that I am going to talk about is the toner transfer method. Basically, we will print onto a special transfer media using a laser printer and then transfer it onto the copper board by applying heat. This is a method that has been discussed quite a bit on the internet. What I am doing different is that I am using a special transfer media that will ensure that all the toner from the paper is transferred onto the copper board. This is important to get a very good trace. The transfer media is from TheMagicTouch called CPM 6.2. You can buy the paper from 12Geeks if you are in Singapore. If you are in Malaysia, please contact Santac Sdn. Bhd. Below is a video demostration. To print onto the media, it would be best to use a colour laser printer instead of a black and white laser printer. The reason is that by printing the black in colour mode, the black toner on the paper will be more dense and will ask as a better mask when doing the etching process. 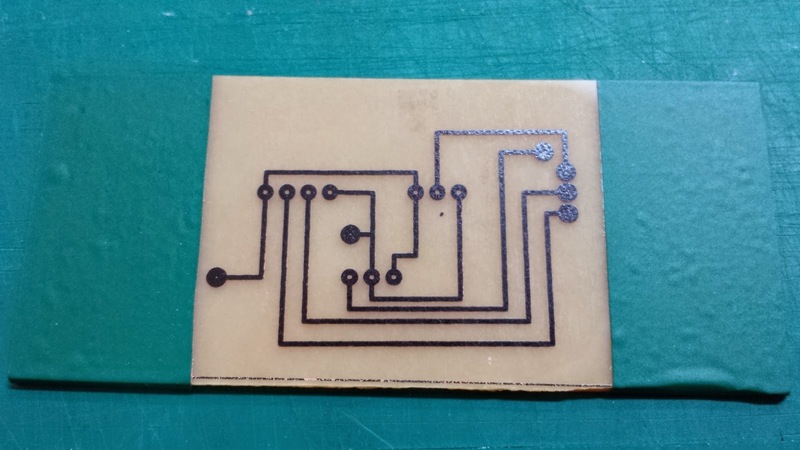 If your circuit is complex and your trace is very fine, it would be best to use a laser printer with postscript. 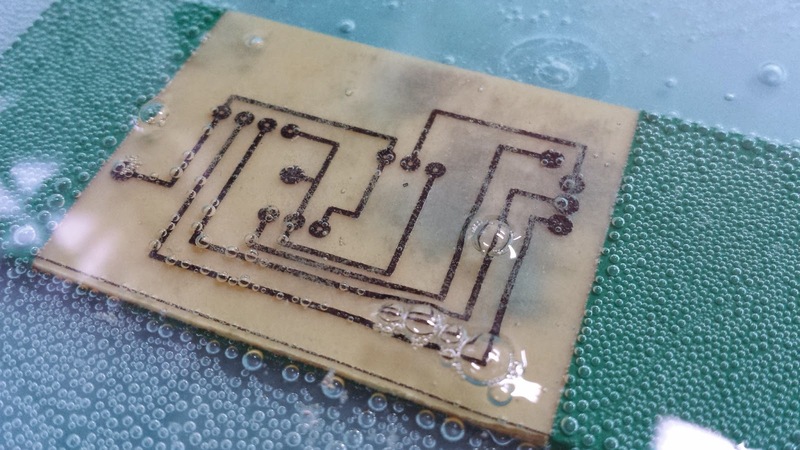 However, if you are only doing a simple circuit, a non-postscript laser printer will work just fine. When printing, set the media mode to a Heavy Setting. If you are using a heatpress machine like the one in the video, that would be the most painless way giving you the best and most consistent result. You will need to press the board at 170 degrees C for 30 secs. If you are using a home iron, set it to the max temperature, or a cotton setting. Cover the board and paper with a cloth and then put the iron on top of the paper and then apply firm pressure for about a 1 to 2 mins. It is important that you do not move the iron. You will need a few tries to get it right. If there are small areas that you need to touch up, you can use a maker pen to make it right. What will happen is that the printer toner will act as a mask / protection. The exposed copper will be etched away and the areas that is covered with the printer toner will be protected. Next comes the etching process. You will need 3 main ingredients. You will also need a plastic container to do the etching in. If you are in Singapore, you can get this at Daiso. 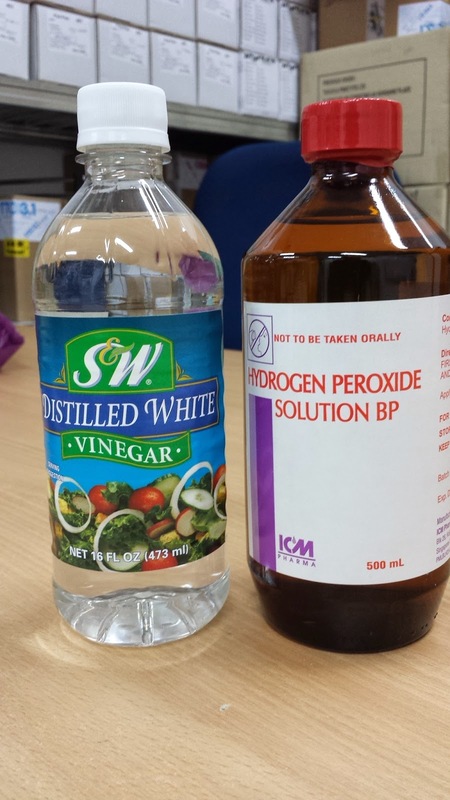 Mix the Vineger and Hydrogen Peroxide in a 1:1 ratio. You do not need to be very accurate with the ratio. Make sure you fill up enough to submerge the whole board in. Then add in about a table spoon of salt. Use something to stir the mixture together. 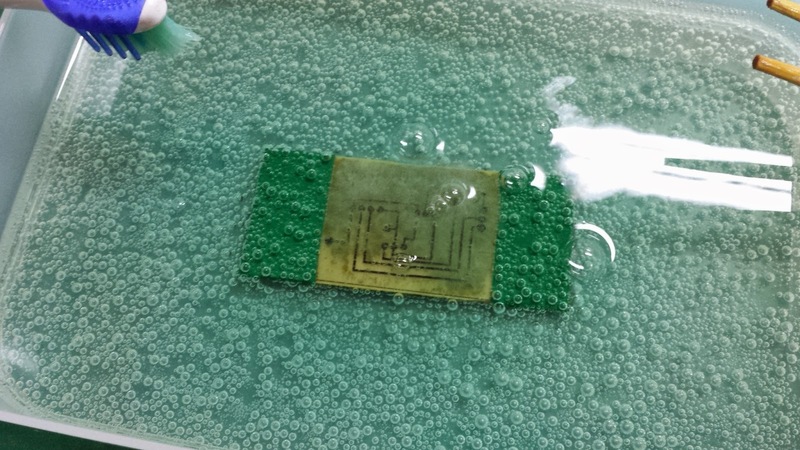 You know that it is working when the board starts to turn yellowish in colour and small bubbles starts to appear. 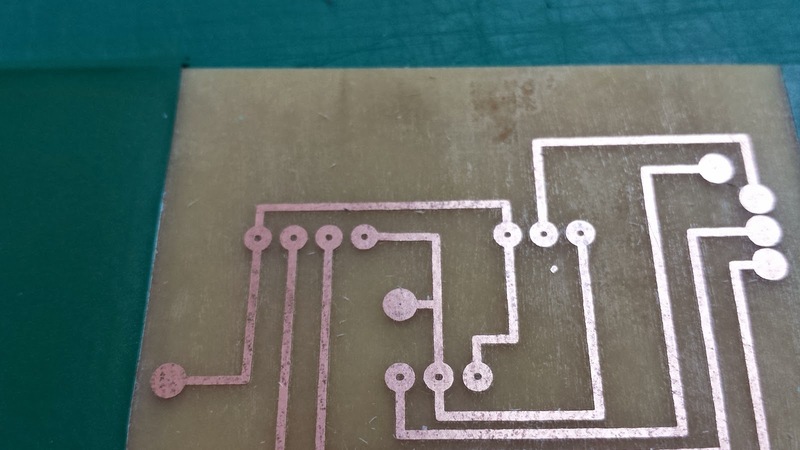 When this starts to happen, use a old toothbrush or a sponge to gently brush away the residue on the top of the board so that the copper below will be exposed to the etching solution. You may or may not get as much bubbles as the picture below. I usually do not get so much. You will need some way to hold the board while you are brushing the board. I use a pair of wooden chopsticks. The solution will then start to turn purple. Just keep going at this for about 20mins to 30 mins. I have observed that from purple, it will then turn a light brown colour and then to light blue. Slowly, the copper will all get etched away, leaving you with just the black toner image. 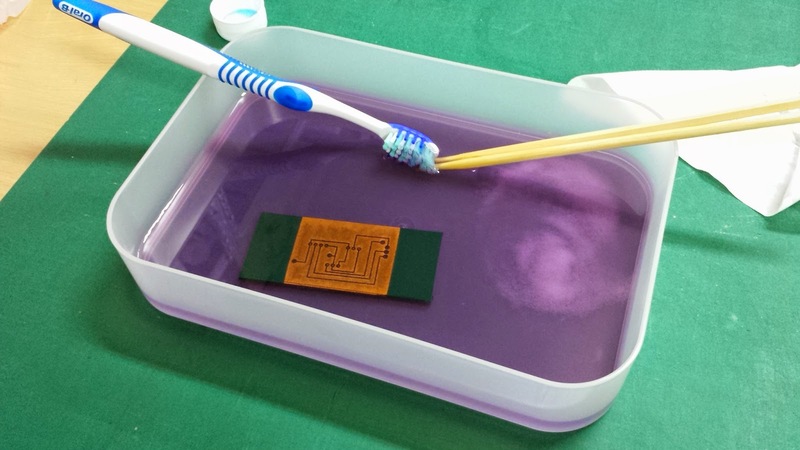 To remove the printer toner, just use a solvent, or paint thinner and wipe off the toner and you have made your circuit board!! I will try to refine this blog post more when I have more time and more pictures. Part 2 on how to drill a PCB board is here.